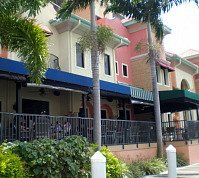 Our favorite Mid-Priced Cape Coral Restaurants - cozy spots, local favorites, and waterfront dining with mouth-watering seafood, steaks, nouvelle cuisine, delicious ribs and more! Whenever I go out to eat, I like to get fish because we have lots of delicious and fresh seafood in Florida. But, I also love ribs, steaks, pizza, Italian, burgers, American classics, and Mexican food. We have so many terrific restaurants in Cape Coral for seafood and everything else, that we love and you will too. With such a variety of dining options ....... I say, so many Cape Coral restaurants ...... so little time! You can expect to pay approximately $10-$20 for a dinner entree. The Nauti Mermaid, a dockside bar and grill, is at The Resort at Marina Village. 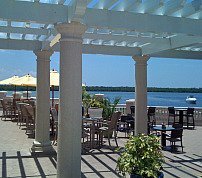 The views are terrific of the marina and the Caloosahatchee River. Menu items range from sandwiches to wood-fired pizza and salads. There is live music over the weekend and it's nice to sit outside on breezy summer evenings, during the day when it's not too hot, or by the fire pit at night when it gets a bit chilly. Fathoms is a great place to go if you want to dine in style but not spend so much money. The Joint serves lunch and dinner, and is located at Cape Harbour, a yachting community with shops and luxury condos. I love their thin crust pizzas, or we also like to order a bunch of their appetizers for dinner, to share when we go with a group of friends. They also have a few dinner specials each night that is the finest in Cape Coral dining and nouvelle cuisine. You can sit out on the porch and enjoy the views of the harbor or sit inside and enjoy the hip decor while you enjoy your meal. Lobster Lady Seafood Market and Bistro has terrific seafood, steaks, raw bar, plus sandwiches, soups, salads ....... and their famous lobster crane game machine. Everything is very fresh, seafood is flown in twice a day and also picked up daily from Pine Island. It is very popular and is getting rave reviews. Different specials are featured everyday, and you can listen to live music Tuesdays and Sundays. Sit inside the sleek and chic dining room or they have outdoors cafe seating. The Boathouse Tiki Bar and Grill is located at Yacht Club Beach. They took over the spot where KC's Riverstop used to be. Not only does the Boathouse feature delicious seafood and cocktails, but they also have fabulous views of the river. Owned by the same people as Fords Garage, you can gas up your boat there and even have them cook up any fish you've caught while out on the pier or on the water! 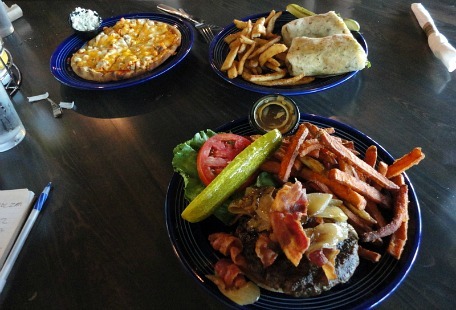 Woodys Restaurant and Island Rum and Grille is a sports bar and family restaurant that serves up yummy burgers, seafood, and all your favorite American cuisine. I love their ribs and pulled pork. Spacious booths can accommodate lots of friends and family to watch the game together. 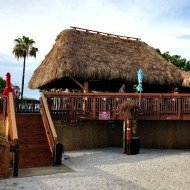 Or, sit outside under the tiki hut and listen to live music! 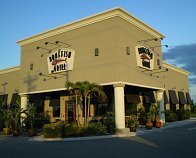 Another one of our favorite Cape Coral restaurants is Bonefish. Even though Bonefish is a chain restaurant, we absolutely love it and I highly recommend that you go. For appetizers, my kids love the Bang Bang Chicken and I love the Bang Bang Shrimp. They serve bread with pesto that's to die for. For your main course, you can pick from grilled, sauteed, or baked specialties. seafood, add a signature sauce, two side dishes and you will have one of the best meals you've ever had. Do you love barbequed ribs? Rib City has the best baby-back barbequed ribs. Dinner is served with garlic bread and a choice of two sides. Try their different barbeque sauces. You can also get other barbequed meats and sandwiches. You will also want to get at least one order of the Three Cheese Fries, forget your diet, they come with real bacon bits and spicy or regular ranch dressing...... yum! 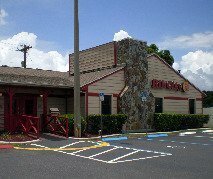 Rib City has two Cape Coral restaurants for your convenience. Island Cafe on the Bay has the best sunset and waterfront dining! They are also the only restaurant in the area that has broasted food, a healthier way to eat fried fare. Point 57 - Gourmet dining and craft cocktails in a fresh, contemporary setting. 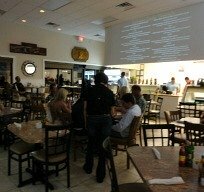 Fins - Great seafood, live music, tiki hut bar, updated restaurant, best crab cakes! Mr Brews Taphouse - Go for the craft beer, yummy burgers, fresh-cut fries, and fried cheese curds. Fords Garage is also a sports bar and restaurant that has the cool theme of old Fords and 1920's garage, with amazing burgers and craft beers. Nevermind Bar and Eatery on Cape Coral Pkwy is a modern downtown-style bar and restaurant that serves nouvelle cuisine and cocktails in an intimate setting for lunch, dinner and Sunday brunch. 10 Twenty Five on Santa Barbara serves up gastropub-inspired food at reasonable prices for lunch, and dinner. Monarca serves up authentic Mexican food with waterfront dining and traditional mariachi music, in the old Jimbos building. Duffys Sports Grill serves burgers, wings, ribs and so much more; 2-for-1 drinks all day, and has over 100 TV's plus member rewards. Overtime Sports Bar and Pizzeria has delicious pizza and great pub food, live music, and plenty of TV's for watching the game. New England Moorings has wacky beach decor to go along with their terrific Floribbean and New England style seafood dishes. Anthonys on the Blvd brings to Cape Coral good food at good prices, live entertainment, and comedy. Ceno Grille is the place to go for Mediterranean specialties inspired by Italian and Greek cooking. Buon Appetito is for those who love Southern Italian Cuisine ..... go for their pasta, seafood, pizza, and desserts. Two Amigos specializes in Mexican-American cuisine, this bar and grill is on Cape Coral Pkwy. Micelis, on the way over to Matlacha, has waterfront dining, delicious seafood, and Prime Rib for 2 for $20 on Thursday nights. The Sandy Hook Restaurant, also in Matlacha and on the water, has great seafood and the cool thing is that you can watch mullet jumping while you dine. Bubbas Roadhouse has award-winning ribs and steaks, and seafood, burgers, Mexican dishes, and lots more. Mexico Lindo serves authentic Mexican food, tableside guacamole, and a festive ambiance. I'm getting so hungry writing about all these terrific places to eat! There are still many more that we would like to try, so you may want to subscribe to my monthly newsletter, Gator Bites, to see what dining adventures we've been on next. I promise to use it only to send you Gator Bites. You may also want to check out my pizza and ice cream pages for more Cape Coral restaurants. Here's an idea ......... you may want to try Bite Squad a food delivery service that works with many Cape Coral restaurants of all kinds, from fast food to fancy. Delivery charges run about $1.99 - $4.99. 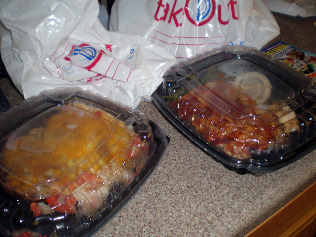 Food is delivered hot, usually within 45 minutes. It's so convenient, and it's fun! When you're not in the mood to cook, don't really want to go out, and you want to have something different than pizza delivered, Bite Squad is the delicious alternative.